Okay, here's a piece I've been thinking about posting for a while. 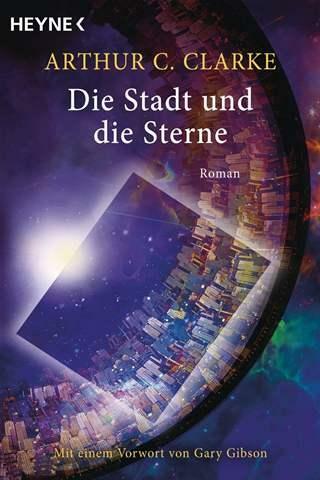 I mentioned last year that I had been commissioned by the German publisher Heyne to write an introduction to a then-new edition of Arthur C. Clarke's early work City and the Stars (Die Stadt und die Sterne). In terms of sheer money per word, it's the best paid writing I've ever done. But I had to work fast: I had perhaps three days to write the introduction, and I'm mercenary enough to admit the money made it more than worth it. After that, it was off in the email and then to a translator. And since it's otherwise only available in the German language, I thought I might as well post it up here. So here it is. Arthur C. Clarke really messed with my head when I was a kid. It must have been about 1978 when I heard from a friend at school that our English teacher had been reading out, to another class a couple of years ahead of me, parts of an essay I’d written for an assignment. I had no way of knowing whether he had done this because he thought my essay — on the works of Arthur C. Clarke — was brilliant, or because, as I secretly suspected, it stank worse than anything he’d ever read before. I pictured a bunch of fifteen and sixteen-year olds sitting in some dimly lit classroom and snickering in concert over my awful, lurid prose. I steeled myself for the worst, thinking: I could run away to sea. Or join the circus. Anything, to spare myself the awful embarrassment once word spread around school. As it turned out, that teacher (whose name, funnily enough, was Mr English), really, really liked my essay, enough so that he gave it an A+. He asked me about some of the phrases I’d used — terms like geosynchronous orbit and three-body libration point. I explained that Clarke had been the first to come up with the idea of building telecommunications satellites that could maintain stationary orbits over fixed points on the Earth, and that three-body libration points were specific areas related to the orbits of the Earth and its moon where large, orbital colonies might be constructed, an idea first used in Clarke’s 1961 novel A Fall of Moondust. I remember writing that essay with all the delirious joy of a puppy chasing a rabbit on the first day of spring. Up until then, in English class, the subject matter of our essays was chosen for us by the teacher, so being given the freedom to pick any author to write about I wanted was like tossing a lit match onto dry newspaper. I had, I recall, only recently exhausted the supply of Arthur C. Clarke novels in the school library, including The City and the Stars, quite possibly the first of his novels I ever read. That book was like nothing else I’d ever encountered before, offering as it did a way of seeing the universe that set it apart from much of the rest of the science fiction genre when it was first published in 1956. Then, as now, science fiction was a predominantly American genre that experienced its first boom during the pre- and post-war years, in pulp magazines bearing names like Astounding Science Fiction and Amazing Stories, and many of the stories published therein tended to have a distinctly American flavour; they were tales where few obstacles could not be overcome by pluck and ingenuity, and where men armed with a slide-rule in one hand and a blaster in the other set out to conquer the stars in much the same way their ancestors had once conquered the vast, grassy plains of the American heartland. But writers of fantastic fiction originating from other countries had a quite different way of seeing things, particularly those from the United Kingdom. There, authors such as John Wyndham and Arthur C. Clarke, and HG Wells before them, were the product of a more pessimistic literary tradition born of a fading British Empire. Their stories and novels were more likely to depict a universe not only indifferent but even actively hostile to the human race, where victory was far from guaranteed or even possible. Where Well’s Martians incinerated the Victorian English with impunity, and Wyndham’s Kraken flooded the Earth before conquering it, so Clarke, in the book you hold in your hands, portrayed a defeated empire in the long twilight years of its collective senescence. His eternally self-repairing city of Diaspar languishes under a sun a billion years in our future, adrift in a wasteland of desert, its streets and parks filled with ancient and ageless citizens pursuing the long-dead dreams of their more adventurous forebears. All that is left of their star-spanning empire are memories encoded into the circuits of their city’s great computer banks. At first it appears to be a bleak vision of a dying race, but in reality it’s the beginning of a story of optimism, of the human spirit’s ability to overcome obstacles in order to satisfy its burning desire for knowledge. Alvin, the first child to be born in Diaspar for some millions of years, is typical of most Clarke protagonists, in that he is driven by that same urgent sense of curiosity when confronted with the question of what might lie beyond the desert surrounding Diaspar. There are echoes of that same desire to literally push beyond the boundaries of knowledge in Clarke’s 1973 novel Rendezvous with Rama, wherein the crew of the Endeavour explore a long-deserted alien spaceship built on a vast scale, and also in Dave Bowman’s confrontation with the Monolith in 2001: A Space Odyssey. In each, a human being is confronted with the apparently numinous, but proves instead to be the product of science, albeit that of a far more advanced civilisation. This same theme, of an encounter with a civilisation wielding technology sufficiently powerful to make them essentially god-like, can also be found in Childhood’s End, regarded by many as Clarke’s greatest achievement. Clarke famously codified this approach in his 1962 non-fiction work Profiles of the Future, where he stated that ‘Any sufficiently advanced technology is indistinguishable from magic’. In other words, when we finally do venture out to the stars, we may encounter beings literally beyond our comprehension. Few other authors understood as well as Clarke that whatever other civilisations our species might one day encounter, they will almost certainly have risen and fallen long ago, so that their legacy is likely to come only in the form of dusty ruins and inexplicable artefacts. What sets The City and the Stars apart from the rest of Clarke’s oeuvre in this respect, however, is that the inexplicable technology that surrounds Alvin is implicitly the creation of his own ancestors, rather than that of alien minds. Alvin’s quest also bears the clear influence of Olaf Stapledon, another British writer whom Clarke greatly admired. In books such as Last and First Men and Star Maker, published in the pre-WWII years, Stapledon mapped out entire future histories of not only mankind but the universe itself. It’s a quite staggering scale of perspective, and one Clarke makes ample use of in his descriptions of Diaspar’s long history. When I look back across the thirty years separating me from that school essay, it becomes clear just how much Clarke’s philosophy informed my own. In the future worlds he created, few virtues are as noble as the human desire for knowledge, and advanced alien life, rather than being inimical and bent on invasion or destruction, instead seeks to nurture, protect and even guide humanity. And where Clarke’s peers at the time were busy generating grim post-apocalyptic visions of an Earth destroyed by nuclear weapons, Clarke instead seemed to suggest that the future was not only a better place, it was one we could actively create. The Clarkean view of the human race is essentially that of a species only just emerging from a long, dark childhood, still afflicted by superstition and ignorance, but ready to grasp a bright and glorious destiny knowing no boundaries of race or religion. He was, in his way, the nearest thing science fiction ever had to a genuine prophet, pointing the way to what felt like a real and tangible destiny if we only had the courage to accept it. As I sit here in front of my computer, linked into a vast global library of information not too different from what Clarke himself once envisioned, it’s easy to see that we live in a world he had some small part in creating. He was the first to suggest that satellites could be used to broadcast telecommunications, and lived long enough to see developments in space exploration that would have seemed outrageous fantasy when he first saw publication. When he died in 2004, Arthur C. Clarke left behind a body of work that continues to inspire successive generations. He was a man with an unfailing appetite for every new advancement in science, and who enjoyed scuba-diving because it was the nearest he could get to the experience of floating in zero gravity. In all the essential details, Alvin, locked inside his shining city of the far, far future, is the embodiment of everything Clarke held to be true about the human spirit.